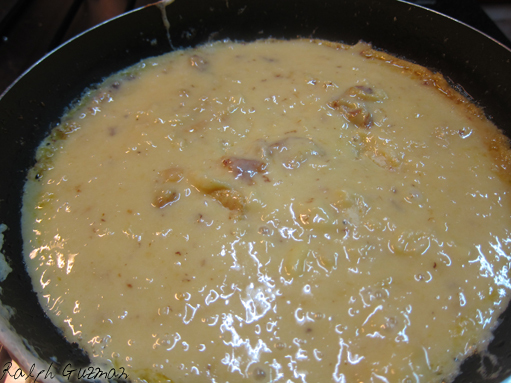 Filipinos have a love affair with practically every dish that has custard. Yema is one of them. People love its golden color, and go crazier over its rich, sweet, creamy taste. 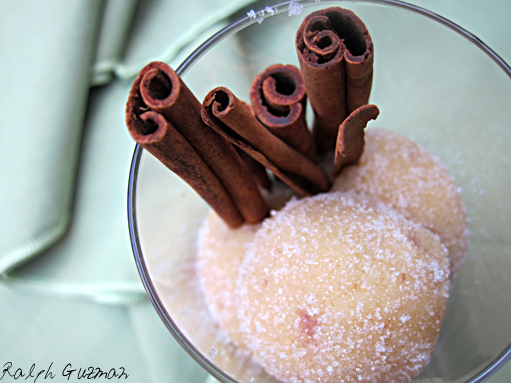 These custard candy balls are usually eaten as dessert or as a snack. 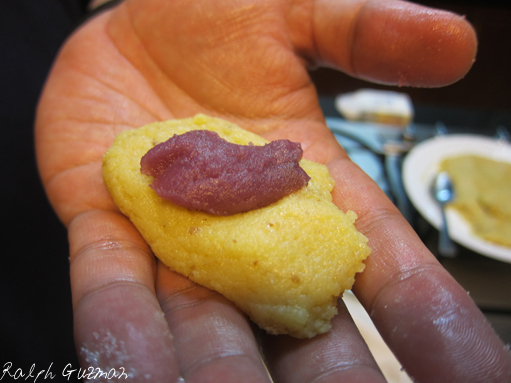 This version is even made richer with ube (purple yam) filling. How good are they? Well, once you pop, you may not be able stop! 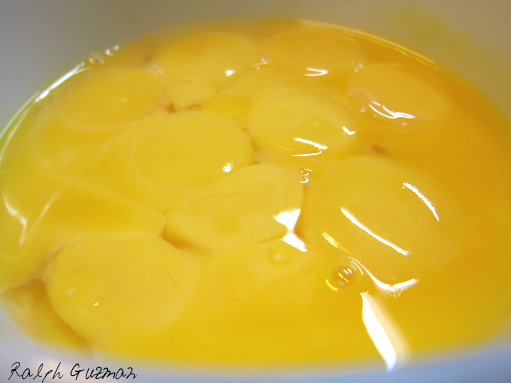 1) In a mixing bowl, mix the egg yolks, condensed milk, vanilla extract, and salt until combined. I make sure that the eggs are chilled to easily separate the yolk from the egg whites. 3) Stir constantly using a silicone spatula or wooden spoon to prevent the mixture from getting burned. 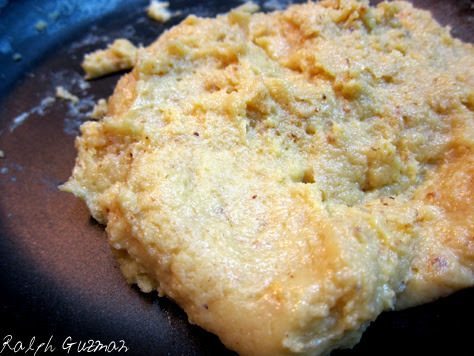 4) Cook for about 15 to 20 minutes or until it has the consistency of mashed potato or soft cookie dough. Once this consistency is achieved, turn off the heat. Allow to cool in room temperature for 15 minutes. 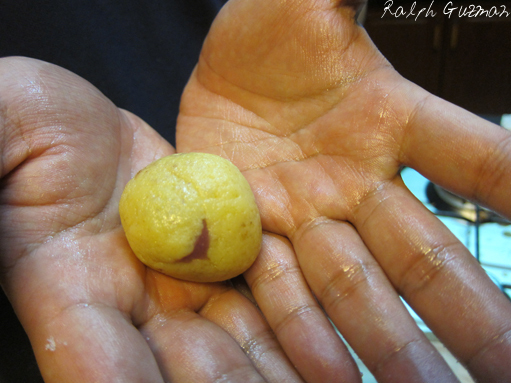 5) Shape the mixture into balls using 2 teaspoons of the mixture, and putting ½ tsp. ube in the middle before shaping them into balls. 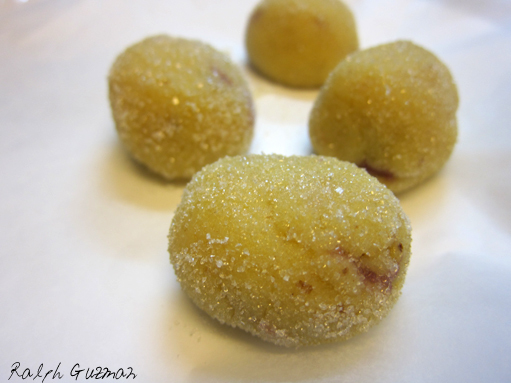 6) Lightly roll the balls in sugar. This recipe makes about 15 to 20 balls. 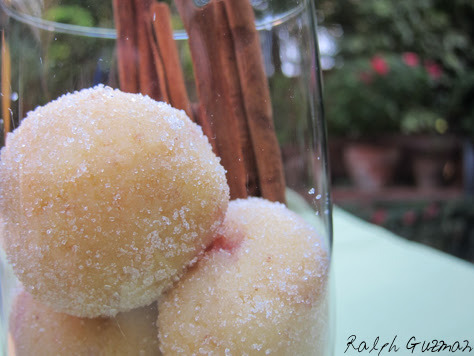 Extra tip: Nutella spread makes a superb dip too for these yema balls. Enjoy! This recipe served as one of my two contributions to the latest issue of Expat Magazine — together with the Caldereta ala Osso Buco. Again, many thanks to Expat Magazine for the wonderful opportunity. Many special thanks to TJ and JV Ramos for making the contribution possible. Friends, Expat Magazine is still available at leading bookstores and magazine stands. Hope you can all buy the magazine! This entry was posted in Dessert, Food + Recipes and tagged Candy, Expat Magazine, Filipino Candy, Filipino Dessert, Filipino Desserts, Philippine Candy, Philippine Desserts, ralph guzman, RatedRalph.com, Ube, Yema, Yema Balls, Yema Balls Recipe, Yema Balls with Ube Filling, Yema Balls with Ube Filling Recipe, Yema Recipe, Yema with Ube Filling by Ralph. Bookmark the permalink.